Using Canvas External Apps (sometimes called LTI tools), instructors can easily add new features to Canvas courses. 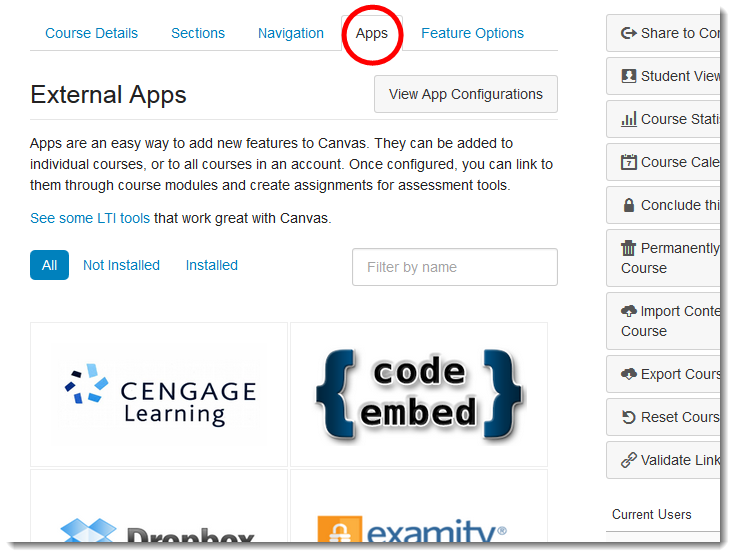 Canvas apps can be added to an individual course, or to all the courses in an institution. Once an app is installed in Canvas, instructors can link to the app from course modules, use it to create assignments for assessment tools, or add it to a course’s navigation. Some apps are not preconfigured at the institutional level but are available for you to install at the course level, and they are referred to as whitelisted apps. Installed apps are ready to be used within your course content areas or from the course menu whereas whitelisted apps require you to configure them for your course before they are available. To see a list of preconfigured and installed apps click here. Not all Apps appear on the Course Menu and some need to be selected as an external tool when creating a new assignment or Page. If you are unsure on how to access an App in your course its Course Placements information may provide you some insight on where to go. Placements are locations in the course that App can be accessed from such as; Course Menu, Assignment Selection, Editor Button, Link Selection, and more. To view an App’s Course Placements first to go Settings and click the Apps tab at the top of the screen. The External Apps page displays all of the white listed and installed apps for UNF. To get to the apps’s Course Placements click the View App Center button and a list of only the installed apps appears. Click the i icon to the right of the app name and a pop-up window will appear with the placement information. In some cases there will be no placements listed, but this does not mean it is not accessible. 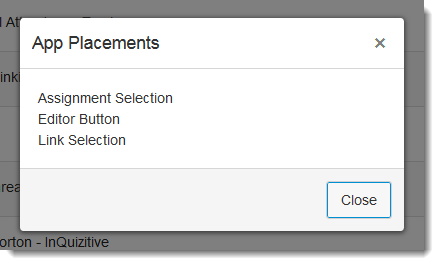 For example VeriCite shows no placements but it is access from the External Tool Assignment Type when creating a new Assignment. If you are unsure of a tools placement in Canvas you can go back to the App Center and click on the tools description or contact CIRT, cirtlab@unf.edu or 904-620-3927.